As we close out 2017 and head into 2018, I can’t help but reflect on the past year. If I’m being honest with you, and I strive to always be honest with you, I am still not always sure that I am the right person to lead The Ranches. I was pretty comfortable being in charge of the staff and never really having to feel the weight of ensuring the integrity and longevity of what was built by those who came before me. Sometimes I miss my “comfort zone” and dread all of the responsibilities and expectations that come with leadership and with helping kids who are hurting. While you may think of this as a personal weakness or an attempt at false humility, I assure you that it is neither. Sometimes, I simply get insecure. I have to remind myself to work through it and to get back to doing what needs to be done. After all, who am I to doubt or fear the kids or the path that God placed in front of me? 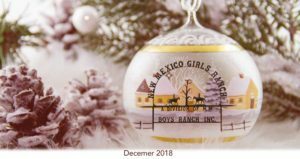 Accepting and embracing my role at The Ranches has been a learning experience and has caused me to reflect and examine what I am made of and what principles and values that I want to live by. 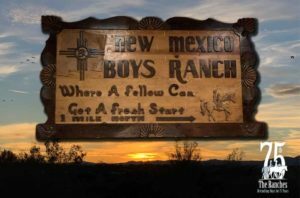 I’ve also had to consider what principles and values that I want as the defining characteristics and hallmarks of The Ranches. As for me, honesty, faith, love and hope are the guiding principles that I want to aspire to and live by. They are also the principles that I want to instill in every staff member of The Ranches and every kid that we have the honor of serving. the hardships of life. Who needs faith when everyone tells you that faith is for suckers? And what about love? Most of the kids at The Ranches have never experienced love that doesn’t hurt. Who needs that? Unfortunately, I simply cannot accept that young people are better off without honesty, faith, love and hope. And if you work with them long enough, you realize that they don’t really accept it either. They desperately want someone who is honest with them, something to believe in, someone to love them and hope for a brighter tomorrow. This is our mission at The Ranches and it takes a monumental effort in order to be successful. Thankfully, you are an amazing group of people and you’ve made it possible for us to continue to guide and teach these hurting young people. Through our program, our parenting classes and, most recently, our return to partnering with and utilizing horses to help kids and their families in the healing process, we are able to begin to see real change in kids and in their families. Tension starts to be replaced by smiles and stress starts to be reduced. Eventually, fear can be replaced with love and conflict can be replaced with affection and a genuine desire to change and to connect. If we get it right, we are able to inspire young people to live honestly, believe in themselves and in Him, love themselves and their families, and hope again. This year, I am stepping completely outside of my “comfort zone” and I am asking you to join us in building something that will truly help kids and families. I am asking you to support us in building an indoor riding arena on our campus. While this is a much larger project than we typically ask you to support, we are hopeful that, with your generosity, we can work with kids and their families throughout the year in order to reconnect them with each other and to help them to establish principles and values that will allow their family relationships to heal. While it may take several letters and some patience to reach this goal, I genuinely believe that this arena will provide us with another powerful tool in our mission to rekindle hope. Please join me in seeing this project come to fruition. I will be updating everyone through our Corral and other correspondence as we make progress. Thank you in advance for supporting this project and for continuing to support The Ranches and our mission. Honesty, Faith, Love and Hope. Thankfully, a generous donor has offered $25,000 to be used as a matching grant to help with the $150,000 cost of our indoor riding arena. That means your gift of $25.00 will become $50.00. A gift of $50.00 can provide $100.00 and a gift of $100.00 will become $200.00. Any money we receive in excess of this project will be used for general operating. Thank you again for a successful 2017, we are looking forward to an even better 2018. Wishing you and yours a Happy New Year.